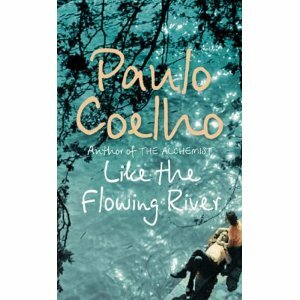 Like the Flowing River is an intimate collection of Paulo Coelho’s reflections and short stories. These are powerful tales of living and dying, of destiny and choice, of love lost ad found. Sometimes humorous, Sometimes serious, but always profound, this book, like all of Coelho’s work, explores what it means to be truly alive. I Found the book on Dad’s Book-shelf , on one of my trips home last semester. The description seemed interesting and so i decided to take this, beside a couple more books that would last me a month or so in the hostel( Reading is what i mostly do in my free time, and not many people seem to read my kind of books there so mostly end up taking a few from home every trip 😐 ). The return to college was by the afternoon train. I was getting rather bored after a while and finally thought I’d read some book. So i picked Like the Flowing River. The book kept me riveted to my seat and that train ride turned out to be the fastest ever( No, not because I was on a shatabdi ;), but because time just flew by). Before I knew it I’d reached my station and yes I’d almost finished the book :). The Book is all about the author’s Thoughts and Reflections. Here are two excerpts from the book that I liked the Best. ** The second is a beautiful story on how an individual can learn a lot of virtues even from a pencil. I’m not posting the entire story here, but the protagonist talks about how, If one manages to hang on to the following qualities, can always be at peace with the World. ‘First quality:You are capable of great things, but you must never forget that there is a hand guiding your steps.We call that hand God, and he always guides us according to His will. Second quality:now and then, I have to stop writing and use a sharpener. That makes the pencil suffer a little, but afterward he’s much sharper.So you too must learn to bear certain pains and sorrows,because they will make you a better person. Third quality:the pencil always allows us to use an eraser to rub out any mistakes. This means that correcting something we did is not necessarily a bad thing;it helps to keep us on the road to justice. Fourth Quality:what really matters in a pencil is not its wooden exterior,but the graphite inside.So always pay attention to what is happening inside you. There are several more paragraphs in the book that are worth quoting-it makes you think about the very essence of life. The book can be read over and over again, all the more when you need some Hope and Faith. This is one book I’d want to have on my Book-shelf forever :)!